As a Gift – A woman’s Rite to Herself was birthed, the labyrinth appeared as a symbol representative of this inner journey to self. This ancient design is symbolic of entering the unknown and journeying to the truth of oneself at the core of being. Unlike the maze, a puzzle that is designed to confuse and hinder progress, there is one clear pathway to the centre of a labyrinth, and a clear pathway out. It is impossible to get lost. The labyrinth is a form of sacred geometry that appears in many forms throughout human history and is traditionally located on sacred sites, power places or energy vortices on the earth. Many of these are the sites of churches and some still exist under the foundations of these buildings. Chartres Cathedral in France is renowned for its labyrinth as is its sister church, Grace Cathedral in San Francisco, which has both an indoor and an outdoor labyrinth. Each labyrinth has been walked by many thousands of pilgrims, and can be seen, symbolically, as a walk of initiation, death and rebirth. Other labyrinths are found in India, Arizona, Java, Peru, Iceland, Crete, Egypt and Europe, and can be traced through early Minoan civilizations back to the Neolithic. Appearing in several different forms, each is inherently designed for the same purpose: as a form of meditative inquiry, an entrance into sacred time and space through ritual dance to seek insight at the centre of the unknown. By physically walking the pathways towards the centre, each pathway turning back on itself over and again, it is believed neurological pathways are activated between the left and right hemispheres in the brain and that we literally begin to unravel our current viewpoint on reality. The inner and outer worlds become congruent and balance can be restored. At the point of entering the labyrinth, it is usual to have a question or to set an intention and then surrender it up to ‘grace’ or ‘God’ to reveal the answer. On the way to the centre, thoughts and energies are often released or shaken off and on entering the centre, you simply stop, wait and receive. There is no question the journey to the centre can be tough. The labyrinth is traditionally fraught with perils. In surrendering and allowing the journey to unfold as it will, you open to guidance and insight. Each journey is unique, no response is the same and guidance or insight appears in many ways. The journey out is often calmer, more meditative and rejuvenated. Further insights into your current situation may be revealed. It can also be extraordinarily healing when walked at night by candlelight, with music or silence in the background. The labyrinth can also serve as a tool for group alignment, when each member of a group enters with the same inquiry and each receives individual insights that are shared in a circle afterwards. 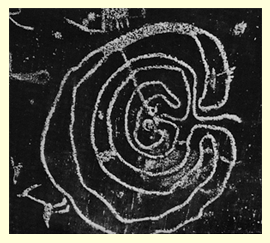 The labyrinth we use as our Shematrix logo is one of the most ancient, found originally in Crete, and closely parallels the spiral, which is a universal symbol of the feminine mysteries. There are many resources available to further investigate this mystical tool and there are many people now dedicated to reactivating its wisdom in our culture through guided walks and workshops.